The #1 thing our clients tell us when we start working together is "I don't know where to start!" If you've ever felt overwhelmed with managing your digital marketing, then this ebook is for you. Get Social! 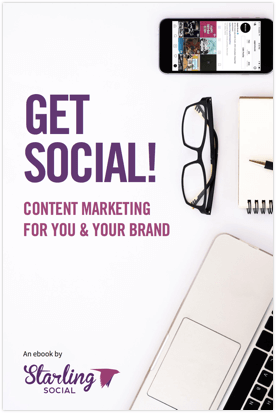 Content Marketing for You & Your Brand comes with a whopping 80+ pages dedicated to helping you understand every major social platform from Facebook, to LinkedIn, to Pinterest. Chapters dedicated to each social platform and why they matter. Glossaries of important terms and lingo for each social platform. Infographics to explain how each social platform looks on Mobile and Desktop views. An Audience Audit questionnaire to help you determine what to share with your target audience. A Blogging Basics page to help you get more value from your website's blog section. Social media questionnaires to help you determine which social platforms are right for you. Sign up for our newsletter and gain access to our 80+ page workbook to get started on your content marketing strategy.